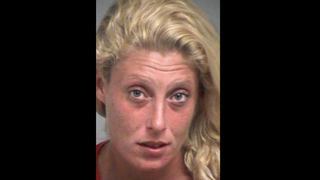 Lisa Marie Elberson, 29, of Lake County, Fla., spent the last day of her Fourth of July weekend in a county jail, the the Orlando Sentinel reports, after allegedly chasing a group of teens down a block wielding a baseball bat. She also allegedly yelled a racial slur at them. Elberson was apparently finishing her husband's fight, authorities say. A 16-year-old teen told police that he and his friends had gotten into a heated exchange with Elberson's husband Sunday. When the teens walked by Elberson's home sometime later that day, they began arguing again, except this time, according to a police report, Elberson spit on the teen and then picked up a baseball bat to chase the group away. One of the teens recorded the incident, and police say Elberson can be heard being racially offensive, saying, "I hang your family from my tree," and then using a racial slur. Elberson was arrested and charged with aggravated assault with a deadly weapon, child abuse and simple battery. Her bond was set at $5,000. Read more at the Orlando Sentinel.